Amador Council of Tourism’s next gathering is Tuesday, December 18th, 5:30 pm at Sutter Creek Provisions. Members are free and $10 for non-members. 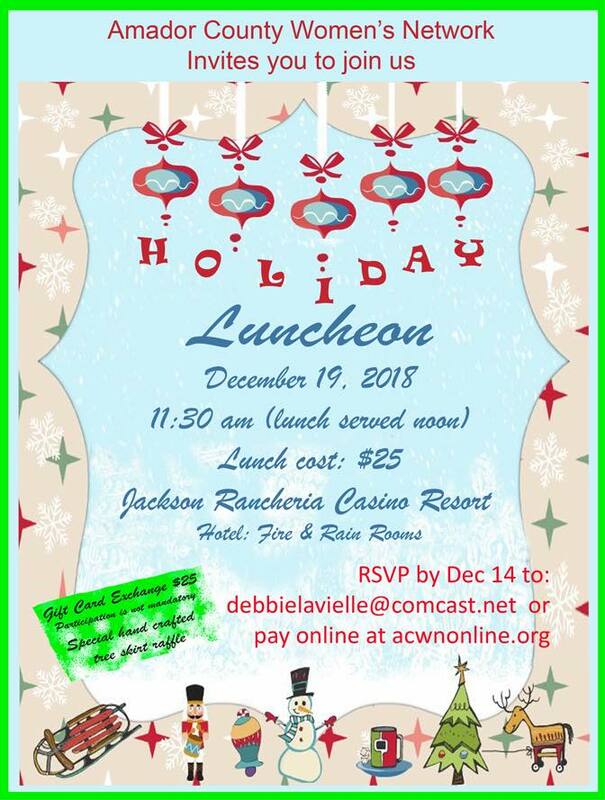 First drink is hosted by Amador Council of Tourism and light appetizers will be provided. 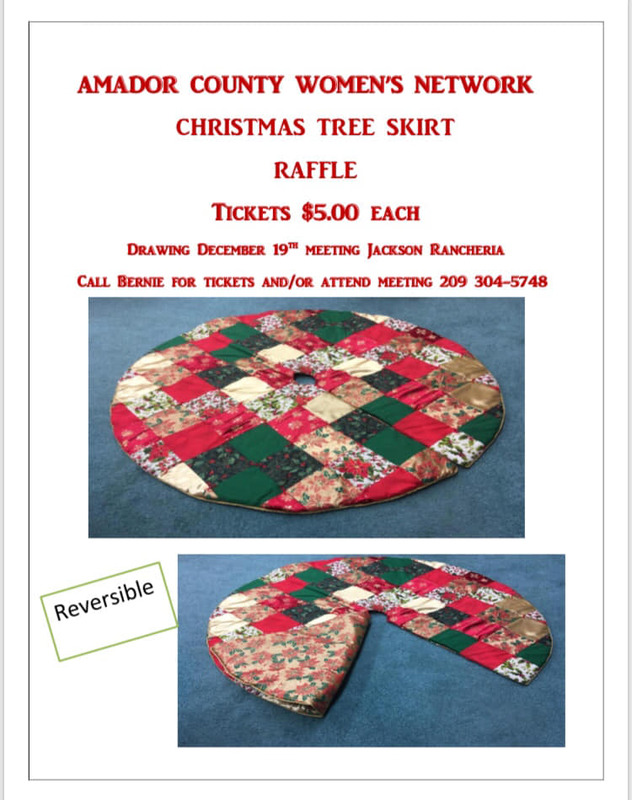 Join Amador Council of Tourism on the night, and enjoy the festivities for free. · And you, our partners, who make it all possible! I am grateful to all of you for the support shown to Amador Council of Tourism this year. I wish you the very best of the holidays, and a prosperous New Year! in store for us at this holiday lunch meeting! made by member Bernadette Cramer! 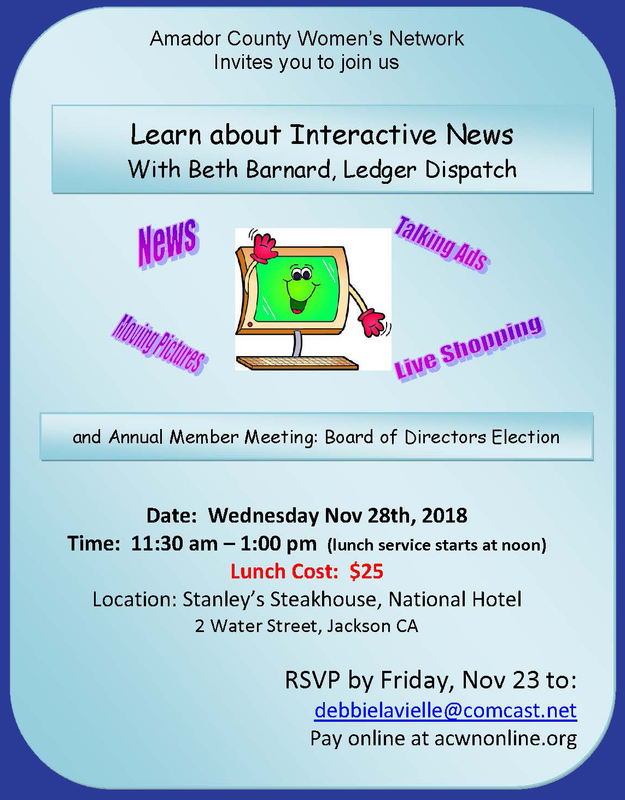 Beth Barnard, of the Ledger Dispatch, presents "Interactive News"
Networking starts at 11:30 am with lunch served at noon. Raffles prizes available as well. RSVP by this Friday, November 23. Please note Meeting location for Thursday, November 8, is changed to Hotel Sutter Banquet room. Below is the agendaa for Amador Council of Tourism’s Board Meeting, Thursday, November 8, 9 am, Hotel Sutter Banquet Room. Please arrive a few minutes early so that we may start promptly at 9 am. All are welcome. 1. Plaid Friday Amador is Friday, November 23. Amador County Chamber of Commerce and Amador Council of Tourism are partnering together to promote Plaid Friday, a "Shop Local" version of Black Friday. Participation is free. Tag the event on Facebook, Plaid Friday Amador. Post photos, too! Create an offer for customers wearing plaid on Plaid Friday, and submit business name, address, phone number, Plaid Friday hours and brief description of your Plaid Friday special to info@touramador.com or amadorcountychamber@gmail.com. Jeanette from Gifted is willing to provide super-cute plaid rosette pins at cost. Contact her by email: shopgifted@yahoo.com. 2. Nominations are open for directors. Terms are one-ear and two-years. If you are interested, please contact me directly by email at maureenfunk@volcano.net or cell, 209-969-5065. 3. General Membership Meeting and Celebration is Tuesday, December 18, 5:30 pm, at Sutter Creek Provisions. More details to come. 4. New fresh website design will launch shortly. The new site will offer a booking engine for Amador Lodging using each property reservation system at no additional cost. Please contact me for more details. 5. 2019 meeting schedule is listed at the bottom of the attached agenda. See you next Thursday at Hotel Sutter and Tuesday, December 18, at Sutter Creek Provisions! Membership Drive: 200 members in 2018. 2-3 new members per director. Buti yoga is a modern and fast growing yoga practice. Buti yoga is a dynamic blend of primal Movement, cardio intensive Tribal Dance, and Vinyasa Yoga, utilizing the spiral structure technique for deep core engagement. The entire workout is driven by the music with the beats setting the tone for hiit style moments, fluid flows, and deep stretching. BUTI means “the cure to something that is hidden” in Indian Maharathi. Our goal in BUTI is to unlock the Shakti energy trapped in the lower two chakras. Anela Garcia is excited and proud to bring Buti Yoga to Amador County. Amador Council of Tourism’s Board Meeting is next Thursday, October 11, 9 am, at Jackson Rancheria Casino Resort’s hotel conference room. Please see the attached agenda (below). The board last met in August and as you review the agenda, you will see that promotion of Amador as a destination has continued on its powerful and effective course. 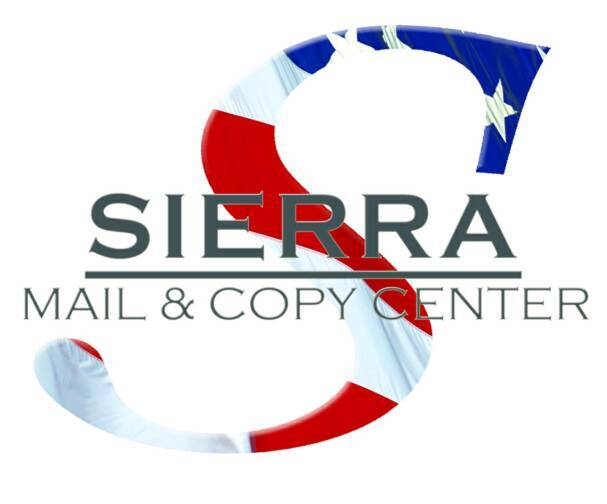 Many thanks to our partners for their investment in Amador Council of Tourism’s efforts: through membership, participation as a co-operative advertising partner, and/or in-kind donations. All are welcome. Thank you to Jackson Rancheria Casino Resort who generously provides a light breakfast, coffee, hot water for tea. The agenda is usually completed within an hour, and we quickly update one another on what’s new with our businesses, destinations, and towns. I hope you will stay to the end. If you cannot make the meeting and have any questions, please contact me at maureenfunk@volcano.net or by cell at 209-969-5065. 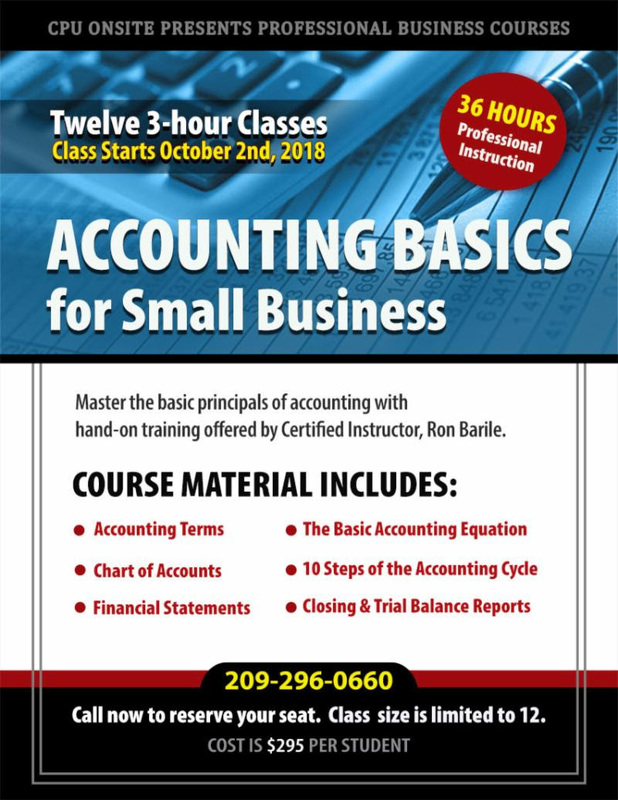 "Accounting Basics for Small Business"
This offer extends to the first 10 students to Register. No application or qualifications required. The Accounting Basics for Small Business course provides 36-hours of hands-on instruction by Ron Barile, a California State Certified Adult Education instructor, certified in General Accounting Principals, Quickbooks, and Microsoft Master Certified Instructor for Microsoft Excel and Word. 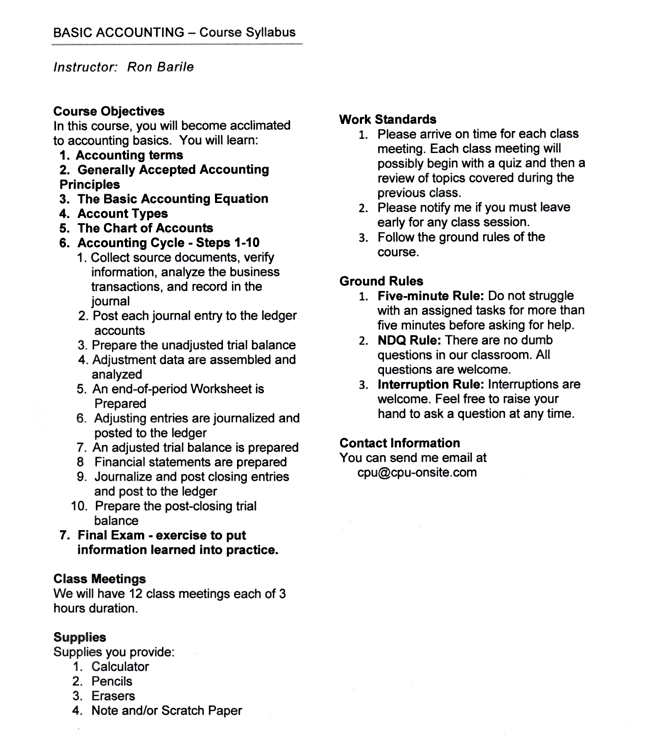 A full course syllabus is included for your review. Please feel free to call with any questions or to register over the phone at 209-296-0660. Presentations are used to inform, educate, motivate, and entertain using the power of words and images. Join us for these fast-paced presentations and you can decide if you are informed, educated, motivated, and/or entertained! And remember - all in one hour! 12:00 pm lunch then winery tour. Only have an hour, not counting travel time ? 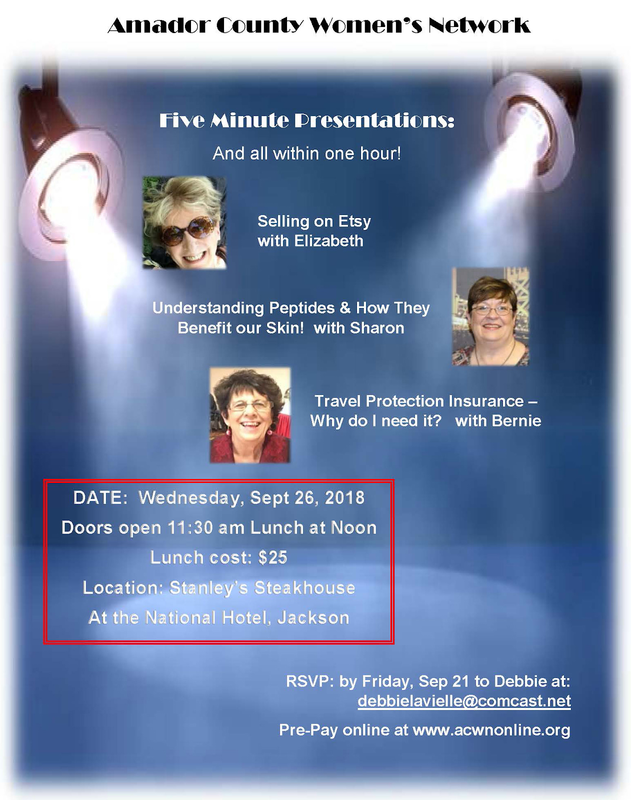 We try to keep the meeting length to accommodate all working women. Come check us out! 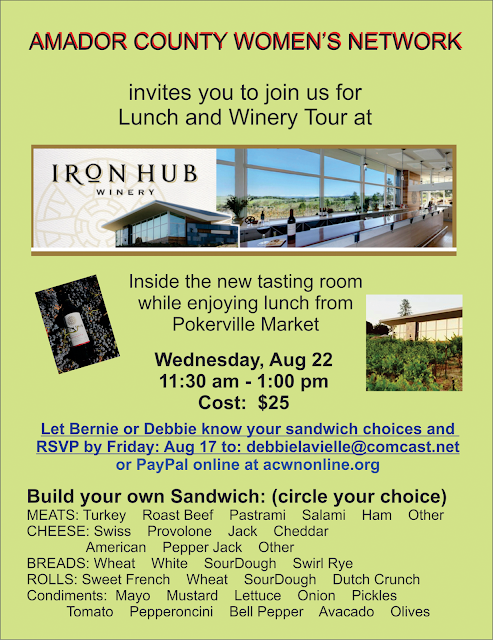 Don't forget to RSVP with sandwich choice to Debbie LaVielle by Friday August 17.